Buy and sell tasks, jobs or services. The true job marketplace. 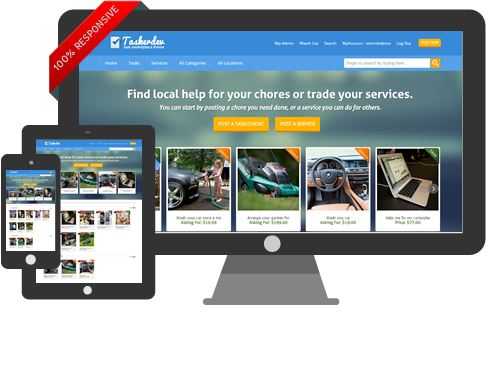 TaskerDev is a wordpress theme, for launching a small job/errand or task marketplace. Outsourcing errands and tasks for cash, and also posting jobs and tasks you might do for a certain amount of cash. Taskerdev is the only wordpress premium theme on the market, that transforms your wordpress installation into a fully featured task or job marketplace. Your users will be able to post tasks they can do, and others can purchase those services. Also users can post their requests, and other users can bid on the requests. With these key functions, you can have your own website where people can buy and sell services or jobs or tasks. Also the Taskerdev theme comes with a feature-rich admin area from where you can control everything happening on your job marketplace website. You can control the layout, the design, the colours and so much more, and you can give your website the uniqueness to make it stand out. It even has predefined payment packages, so you can define free listings, paid and featured listings, and memberships for your users. It can even be integrated with BuddyPress (on demand). Below you will find a list of the most important features available in the Taskerdev theme. Also we will show all the monetization tools available in this theme so you know how to make money online out of your job marketplace website. You will find a more comprehensive feature list on the buy now page once you decide to buy this amazing theme. If you need help with the theme or if you have a question before purchasing contact us or use our forums to rise up your questions. Usualy you get your answer in less than 2-3 hours. Our theme works well on any kind of device. From desktop computers, laptops, to tablets, smartphones, and any type of phones. The theme design will stretch our or shrink automatically to fit your screen size and device. Also the responsive can be turned off if you wish to. The Taskerdev Theme supports the latest version of WordPress. The theme has been tested in wordpress 5.1.1 and works flawlessly. Also each time we keep the theme up to date with the latest wordpress versions. Usually we launch an update each month. With the credit system there is also an escrow feature that comes with the taskerdev Theme. The idea is the gig owner will deposit virtual money into escrow for the bid winner, until he completes the task. After that the escrow is released. And the bid winner, will have the funds in his account, ready for requesting a withdrawal from the admin of the site. The Taskerdev Theme uses the GNU gettext WordPress localization framework. All the strings are kept in a pot/po file. You can use a special tool, called POEDIT and translate the english provided file into your native, or desired language. You do not need any special payment integration, as the theme has already a payment system integrated. Currently it supports PayPal, PayPal Adaptive, Payza, Moneybookers / Skrill, iDeal (Dutch), iDeal Mollie, Sisow, Payfast, Quickpay and Authorize.net, but we can offer services to custom integrate any other local payment gateway. Your users get email notifications, when post a proposal, they get outbid, when they get new proposals posted for their gigs or when they receive private messages. The theme has email notifications for freelancers, when they have received payments for their work. The best feature here: freelancers can signup for certain categories and they can get an email notification when a task is posted in their interest area. Very easy integration with one of the most popular social networks, Twitter. Simply add your twitter account in the backend and your users can follow you. Also each task single page has a share on twitter button. Users will be able to login using their twitter account as well. With the Taskerdev Theme you can charge a percent fee (or flat fee) out of each task/gig that is done through your website. This can be taken directly through PayPal (using adaptive chained payments) or through the credits system, or maybe through some other payment method that we can integrate. This is a great monetization tool for increasing the profits of your website. This tool will help your freelancers and gig providers, to better communicate through a safe system without revealing each others personal information, and keep all activity under your website and also keeping you in control over the transactions. You are in total control of the private messages, and you can moderate from your administration area. Freelancer and service providers rate each other after each completed job/gig and each user has his own general feedback for the other users to see. Then the rating of each user is displayed next to their username by little 5 star rating icons. Also the rating is displayed in user profile and in bidding tables. With the Taskerdev theme your freelancers and gig/job owners can exchange digital downloadable files. Through this feature you can have a freelance job marketplace website for the IT business, where people exchange files and complete the task. You can attach office files, zip and rar archives, or vector format images. Our your students can exchange files with their tutors. Several monetization tools can be used to make money our of your site build with the help of our Taskerdev Theme. The main monetization ways are: charging listing fees, featured listing fees, private bid fees, charging a percent or fixed fee out of each sale, and membership fees. PayPal payment system is one of the most used payment systems in the world. Our theme also supports the new PayPal Adaptive and Chained Payments. Very easy to use, just put your PayPal email address in the back end and start collecting payments. Plug and play feature. Give the chance to your users to “like” the tasks/gigs, and to share them on their facebook wall. This simple tool is very useful for your site’s traffic and popularity. Also through a free plugin users will be able to use their facebook account to login into the website.